It seems like I was just hoarding tickets from Thrift Way to get my free Thanksgiving turkey and planning menu items for holiday parties. I’m in disbelief that Memorial Day weekend is upon us, mostly because that means I’ll be doing sit-ups and eating salads from now until then. Still, I can’t complain – whether it’s weekends in Wildwood or summer in the city, I’m really looking forward to the next few months of warm, sunny weather. Even though we have a handful of holidays in the summer, a weekend without one doesn’t mean there won’t be a celebration. There’s never a better reason to have a cookout or small get-together than having no reason at all. Last minute or impromptu gatherings are usually the best kind and as long as you have a few recipes set to the side in the event that a spontaneous bash starts to take shape, whether you’re crashing a friend’s Saturday night or people happen to show up at your house, the planning and preparation can go just a smooth as your seated, four-course Thanksgiving dinner. 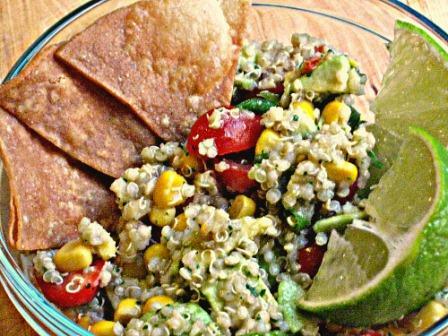 An interesting side salad, like this Quinoa-Avocado dish, can be whipped up in no time at all. Puree cilantro, olive oil, lime juice, orange juice, vinegar salt, pepper and garlic in a blender or food processor until smooth. Cook quinoa according to package instructions and set to the side to cool. To a large bowl, add corn, green onions, tomatoes and avocados and toss. Once quinoa is room temperature, add to bowl and toss thoroughly. Toss in about ¾ cup of dressing, or more according to taste. Flavor with salt and pepper. My Aunt Connie brought this salad to a family party, and my first introduction to this dish was quite memorable; that party was in March, and I’ve been thinking about making this recipe ever since. Not only did I have it as a side dish, with Mexican food, I couldn’t stop myself from eating it with tortilla chips, like it were salsa. The fresh, simple flavor is perfect for a summer side dish, not to mention the ingredients are pretty healthy. Quinoa can be found in the gluten-free or organic aisle of your super market and is considered a “complete protein”, meaning it has a proportionate combination of the 9 essential amino acids. In other words, it’s really good for you. About one cup of dry quinoa produced over two cups of the cooked product, and the method I used was the “energy efficient” instructions on the box: in a pot, combine ½ cup of quinoa to one cup water (one cup dry quinoa to 2 cups water), bring to a complete boil (uncovered), then cover, remove from heat, and let sit for 15-minutes. Though I’m partial to this veggie combination, I’m a huge fan of substitutions: if you hate avocado, swap for black beans, or if green onions don’t appeal to you, use finely chopped red onions instead. The dressing is where the flavor comes in. 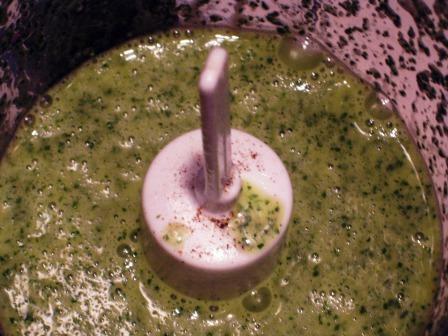 Pureeing the ingredients in the processor results in a beautiful, light green, surprisingly thick vinaigrette. If you follow the instructions above, expect to have extra, which you can serve on the side or use on a traditional green salad. With only a few days until Memorial Day weekend, you might be pressed for time to come up with a dish to take to that BBQ or backyard bash. This one will take you about an hour, and I guarantee you’ll have more than a few inquiries for the recipe. Don’t forget to tell everyone how healthy it is, too, since that’s as big a part of the appeal of the citrusy, clean flavor. I will be adding this to my regimen of green salads and exercise throughout the week to prep for the first weekend of “swimsuit season”. If it means I only have to do one less sit-up, it’s worth it.